For the video game of the same name, see SpongeBob's Atlantis SquarePantis (video game). SpongeBob's Atlantis SquarePantis is the 92nd episode of the American animated television series SpongeBob SquarePants. This episode is a made-for-television musical comedy special directed by Andrew Overtoom. It stars Tom Kenny, Bill Fagerbakke, Rodger Bumpass, Clancy Brown, Carolyn Lawrence, and Mr. Lawrence. Atlantis SquarePantis originally aired on Nickelodeon in the United States on November 12, 2007, following a 12-hour-marathon of SpongeBob SquarePants episodes. In the film, SpongeBob (voiced by Kenny) and Patrick (voiced by Fagerbakke) discover a half of an ancient medallion that helps them and their friends get to the lost city of Atlantis. It was written by Casey Alexander, Zeus Cervas, Dani Michaeli and Steven Banks. British musician and actor David Bowie guest starred as the voice of Lord Royal Highness. Upon release, it attracted an estimated 9.22 million viewers. Despite this, the film received mixed reviews from critics and mainly negative reviews from fans. Patchy the Pirate is stuck in traffic on US 101 near Encino and gets cross that he is going to miss the new SpongeBob episode, and his super rare eight track also breaks down. His cell phone rings, and Potty tells him to hurry because the episode is about to start. Patchy tells Potty to record the episode, but Potty tells him that he threw the Betamax machine in the trash, making him more mad. The traffic lines moves, but suddenly, he finds himself nowhere, and finds out that "Encino is gone", and then he cries that this is not the only time a Lost-City had occurred. He tells us that the episode is what we should watch instead of watching him suffer. Later, Patchy gets his eight track fixed, but not for long when it explodes again and produces smoke. Later on, Patchy gets hallucinations and he finds a man dressed in a tall SpongeBob outfit (who is actually Tom Kenny, Patchy the Pirate's actor and the voice of SpongeBob himself), who tells him that he is SpongeBob SquarePants in real-life form. The Spongebob then tells him that he will be back in Encino if he "believes". Then, Potty wakes him up after he thought he is back in Encino, which is all just a dream. Patchy begins to eat a sandwich, which Potty brings to him, but he finds mayonnaise on it. He tries to give it to a vulture. After the end of the SpongeBob special, Patchy finds Encino shrunk to a very small size, and then, he finds three aliens, which explain that their son, Norbluck 5, was playing with his Shrink-A-Tron again. Patchy yells at them that he wants his town back in full size, and he keeps saying, “There’s no place like home." (Obviously parodying the scene from The Wizard of Oz) Sympathetic by Patchy's misery that he wants to go home because he missed the entire story, Norbluck 5's mother gets the Shrink-A-Tron given from her son, and she presses the big red button control, making a tornado disaster to fix it up. Then, Patchy is glad to be back in Encino, but soon, a giant Potty the Parrot crushes him into the house (presumably showing that Norbluck 5 had once again used his Shrink-A-Tron to make Potty huge). SpongeBob and Patrick find a piece of a medallion to the lost city of Atlantis, but have no idea what it is. They take it to the Bikini Bottom Museum to see if the staff there know what it is. SpongeBob and Patrick run into Squidward, who thinks they stole the missing half of the medallion. He soon matches it to the displayed other half of the amulet and tells them it was the key to Atlantis. After hearing the story of Atlantis, the only thing SpongeBob and Patrick want to see is the "World's Oldest Bubble." Squidward then proceeds to reconnect the two halves of the amulet, opening the "path to Atlantis", which is a bus that runs on "song fuel". When the characters run out of "song fuel", the bus then crash-lands into the city of Atlantis. The group is unknowingly followed by Plankton. At Atlantis, they meet the Atlantean Emperor, Lord Royal Highness who shows them a grand tour of the fortress. During the tour, Mr. Krabs, Sandy, and Squidward each get distracted by places in Atlantis; Mr. Krabs (unsurprisingly) by the treasury room, Sandy by the science laboratory, and Squidward by the art gallery. Meanwhile, Plankton checks out the armory vault, intent on using the city's lost weapons (the Atlanteans had abandoned the idea of warfare long ago) for his own ends. He then chooses his weapon, a tank. Finally, SpongeBob and Patrick get to see the world's oldest living bubble. Patrick takes a picture of it, which causes the bubble to pop. They are afraid to speak, saying they have to go back to Bikini Bottom. Then, Patrick shouts out the "truth." Lord Royal Highness is not enraged at SpongeBob and Patrick for popping the bubble, telling him that the one they popped was just a prop for the tourists. He then shows them the real oldest living bubble, which Patrick then takes a picture of, causing it to pop. Angered, Lord Royal Highness summons the Atlantean Royal Guards to attack, but the gang manage to escape. Just when they escape outside, Plankton comes in and tries to destroy them with the tank he found, but much to his dismay, it showers the group with ice cream. Lord Royal Highness captures Plankton, and says that "a talking speck" would be a fantastic replacement for the bubble. SpongeBob and friends go home, but Patrick, Sandy, Mr. Krabs, and Squidward are all sad because they want to stay in Atlantis, even though SpongeBob does not. David Bowie guest starred as the voice of Lord Royal Highness. Atlantis SquarePantis was written by Casey Alexander, Zeus Cervas, Steven Banks and Dani Michaeli, with Alexander and Cervas serving as storyboard directors, and the animation was directed by Andrew Overtoom. Although it was promoted by Nickelodeon as the first made-for-television film of the series, Atlantis SquarePantis is an extended episode, running 45 minutes. "[Atlantis SquarePantis is] an adventurous quest kind of a story," said Tom Kenny, the voice of SpongeBob, "about SpongeBob and his friends journeying and discovering the lost continent of Atlantis, which is ruled by a character voiced by David Bowie." It's happened. At last. I've hit the Holy Grail of animation gigs. Yesterday I got to be a character on ... tan-tara ... SpongeBob SquarePants. Oh Yeah!! We, the family, are thrilled. Nothing else need happen this year, well, this week anyway. My character in this special longform (I think a half hour special) show is called 'Lord Royal Highness'. Alrighteee!! Tom Kenny said "the people who [watch] are often surprising to me and unexpected. You don't picture David Bowie, the Thin White Duke, sitting on the couch in his pajamas eating Cheerios watching SpongeBob cartoons. [With] our little basic-cable budget we could never afford to pay a legend like David Bowie what he's worth, but the fact he wants to be in something his kid likes is what gets the ball rolling." The film includes 33 minutes of animation. Its animators at the Nickelodeon Animation Studios at Burbank, California sketched the outlines of the story in a year. Paul Tibbitt, the show's supervising producer who also serves as the showrunner, explained "We're one of the last shows that does it the old-fashioned way, like they used to do it back in the Warner Brothers days." Atlantis SquarePantis originally aired on Nickelodeon in the United States on November 12, 2007, preceding a 12-hour SpongeBob marathon. After the premiere, the Behind the Pantis special aired featuring the production of the film from story pitch and animation to voice-recording sessions. It was proclaimed "the most special special that's ever been called a special." On November 13, 2007, the episode was released on the DVD compilation of the same name in the United States and Canada, and on October 27, 2008 in region 2. It also became available in the SpongeBob SquarePants: Season 5, Vol. 2 DVD on November 18, 2008. 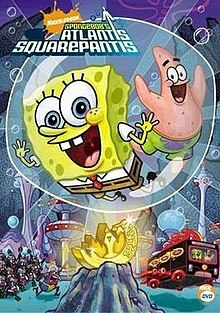 On September 22, 2009, "Atlantis SquarePantis" was released in the SpongeBob SquarePants: The First 100 Episodes DVD, alongside all the episodes of seasons one through five. The film begun production in May 2006, and was delivered to Nickelodeon roughly a year later, allowing time for the network's marketers to promote it. A SpongeBob marathon is a key part of the channel's effort to stave off increasing competition from Disney Channel, Cartoon Network and other rivals. Cyma Zarghami, the president of the Nickelodeon networks, said "We do know that kids like events as much as adults do [...] There's a certain amount of water-cooler talk that goes on among kids." The video game of the same name that was based on the film was released for PlayStation 2, Wii, Game Boy Advance, and Nintendo DS. It was released on November 12, 2007 for Wii, and on October 27 for the PS2, Game Boy Advance, and Nintendo DS. The game was developed by Blitz Games and Altron, and was published by THQ. Atlantis SquarePantis was broadcast on November 12, 2007 on Nickelodeon, and was preceded by an "Z-A" countdown of SpongeBob SquarePants episodes picked by viewers. It attracted 9.22 million viewers, the largest audience of a series broadcast at 8:00 p.m. show on November 12, 2007, with the exception of Dancing with the Stars, and currently the highest audience in the series' history. Happily enough, Lord Royal Highness is voiced by David Bowie, the innovative rock star of yesteryear, and it sounds from his vocal aerobics as if he's having a lot of fun in the role. But the Atlantis adventures of the semi-intrepid little band — searching for and, naturally, destroying the World's Oldest Bubble — are tired. Perhaps the writers and producers imagined they were cleverly spoofing traditional children's stories about magical kingdoms, but SquarePantis seems to be playing it unimaginatively straight. And flat. Tom Shales, The Washington Post. Ian Jane of DVD Talk said "[the season five DVD] is a fun selection of solid episodes and [the film] is excellent [...] Paramount has done a nice job on this release and SpongeBob SquarePants: Atlantis SquarePantis comes recommended." In her review for About.com, Nancy Basile's review was mixed and gave it a score of 2.5 out of 5. She wrote "Kids will enjoy this, but adults, who love the crazy antics, tongue-in-cheek humor and naive blunderings of early SpongeBob will be disappointed." Jerry Vonkramer of ToonZone gave the episode a score of 7/10 and wrote "Atlantis SquarePants [sic] is not a masterpiece, but neither does it deserve the awful reputation it seems to have." Tom Shales, a television critic of The Washington Post, lambasted the film in a November 11, 2007 review. In his review, Shales wrote that "the funniest thing about the film is its title" and "a typical episode has about as many laughs as this inflated version does." Shales also criticized the musical numbers in Atlantis SquarePantis, calling them "numbing." He concluded the review saying that the special was "flat" and "unimpressive". ^ "David Bowie To Guest Star In SpongeBob's First TV Movie". Starpulse. October 29, 2007. Retrieved May 26, 2013. ^ a b c d Walsh-Boyle, Megan (November 12, 2007). "Grammy Winner David Bowie Lends His Voice to SpongeBob". TV Guide. Retrieved May 27, 2013. ^ "Bowie Submerges for 'SpongeBob'". Zap2it. October 12, 2006. Retrieved May 27, 2013. ^ Heritage, Stuart (October 12, 2006). "David Bowie Does SpongeBob SquarePants". Heckler Spray. Retrieved May 27, 2013. ^ a b c d e Wyatt, Edward (November 12, 2007). "SquarePants RoundTrip: SpongeBob's Yearlong Ride to Atlantis, via Korea - Page 1". The New York Times. Retrieved August 1, 2013. ^ Hale, Mike (November 11, 2007). "Television". The New York Times. Retrieved August 1, 2013. ^ Shattuck, Kathryn (November 12, 2007). "What's On Tonight". The New York Times. Retrieved August 1, 2013. ^ "SpongeBob SquarePants -Atlantis SquarePantis". TV Shows on DVD. Archived from the original on October 4, 2013. Retrieved May 26, 2013. ^ Lambert, David (October 16, 2007). "SpongeBob SquarePants - Announcement for To Love A Patty & Rear Box Art for Atlantis SquarePantis". TV Shows on DVD. Archived from the original on October 5, 2013. Retrieved May 26, 2013. ^ "SpongeBob SquarePants: Atlantis Squarepantis [DVD]". Amazon.co.uk. Retrieved May 26, 2013. ^ SpongeBob SquarePants: Season 5, Vol. 2. DVD. Paramount Home Entertainment. 2008. ^ Mavis, Paul (November 5, 2009). "SpongeBob SquarePants - Season 5, Vol. 2". DVD Talk. Retrieved September 14, 2013. ^ Prince, Dennis (November 27, 2008). "SpongeBob SquarePants: Season 5, Volume 2". DVD Verdict. Archived from the original on September 21, 2013. Retrieved September 14, 2013. ^ Wyatt, Edward (November 12, 2007). "SquarePants RoundTrip: SpongeBob's Yearlong Ride to Atlantis, via Korea - Page 2". The New York Times. Retrieved August 1, 2013. ^ "SpongeBob's Atlantis SquarePantis". GameSpot. Archived from the original on October 4, 2013. Retrieved May 27, 2013. ^ "SpongeBob SquarePants: Atlantis Squarepantis". Giant Bomb. Retrieved May 27, 2013. ^ "SpongeBob Atlantis Squarepantis". Blitz Games. August 20, 2007. Retrieved May 27, 2013. ^ "SpongeBob SquarePants: Atlantis Squarepantis". Blitz Games. October 14, 2007. Retrieved May 27, 2013. ^ DeVries, Jack (November 6, 2007). "SpongeBob's Atlantis SquarePantis Review". IGN. Retrieved May 27, 2013. ^ "SpongeBob's Atlantis SquarePantis Nets Series' Biggest Audience Ever, with Almost 9 Million Total Viewers Tuning In". PR Newswire. November 14, 2007. Retrieved May 3, 2013. ^ Starr, Michael (November 15, 2007). "Bowie "sponge" makes splash". New York Post. Retrieved December 7, 2007. ^ Toff, Benjamin (November 17, 2007). "Ratings: 'SpongeBob' Earns 8.8 Million Viewers". The New York Times. Retrieved May 3, 2013. ^ Ball, Ryan (November 14, 2007). "SpongeBob Grabs Big Ratings". Animation. Retrieved May 3, 2013. ^ a b Shales, Tom (November 12, 2007). "'SquarePantis': Squeezing The Life Out of SpongeBob". The Washington Post. Retrieved May 3, 2013. ^ Jane, Ian (November 13, 2007). "SpongeBob's Atlantis SquarePantis DVD Review". DVD Talk. Retrieved December 7, 2007. ^ Basile, Nancy. "SpongeBob Atlantis SquarePantis DVD". About.com. Retrieved May 3, 2013. ^ Vonkramer, Jerry (August 22, 2008). "SpongeBob's Atlantic SquarePants". ToonZone. Retrieved May 26, 2013. This page was last edited on 30 March 2019, at 23:05 (UTC).